Our group focuses on the fine control of nano-micro nanostructures based on molecular self-assemblies. We aim at understanding the fundamental mechanism of the nano-chiral or periodic assemblies and the parameters which controls their morphologies and dynamics. Since the seminal publication by Franz Hofmeister in 1888, the specific ion effect, Hofmeister effect, has been widely reviewed both theoretically and experimentally in a number of colloidal systems on the stability and structure of macro, supra molecular systems. However, a unifying theory is still missing and thus the Hofmeister series yet represents an appealing challenge in colloid and interface science; classical theories based on Van der Waals interactions and the electrical double layer fail to explain a basic fundamental observation. We have been investigating the ion specificity by characterizing the micellar properties with various counterions. 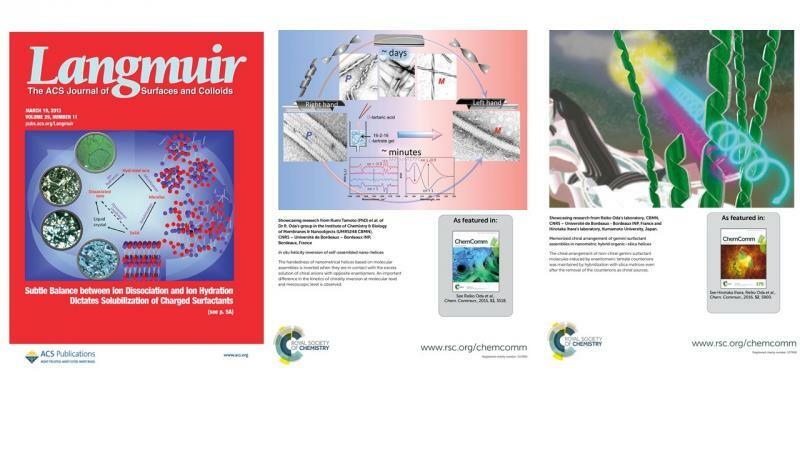 We have developed an international collaborative network which focus on the micellar interface, the distribution of counterions and hydration. Micelles with counterions with various ionic properties, hydration energy, polarizability in water are analyzed in order to quantify interfacial population of counterions and water. We have reported, various chiral self-assembled structures such as twisted, helical, and tubular nanostructures with controllable chirality, dimensions in various solvents. In contrast to the chiral polymers, these structures are based on non-covalent interaction, on crystalline organization of small and often amphiphilic molecules (surfactants, peptides, sugers, etc…) and solvent molecules, and allows designing chiral nanoobjects with pitches and diameters(20 nm - µm) which have been inaccessible with chiral macromolecules. Their morphologies are controlled by parameters such as temperature, small amounts of additives and enantiomeric excess. The originality of these system is based on the modulality of the morphologies of these nano-micro helices, unprecedented properties in the literature. Very recently, we reported for the first time, in situ chirality inversion observed by microscope, with detailed inversion molecular and supramolecular kinetics. Chiral nano helices with controllable (periodicities, diameters, chirality) morpholgies based on self-assemblies of Gemini-type amphiphiles are used as template for synthesizing silica nanohelices, which are further functionalized and used as scaffold for the grafting of metal (ex. Au, Ag) nanoparticles, coating with semi-conductor (ex. TiO2 and ZnO) films, fluorescence dyes, or metal complexes. We aim to design and prepare new chiral catalytic nanomaterials by: (1) grafting catalytic species (polyoxometalates (POMs), organometallic complexes or catalytic nanoparticles) onto chiral substrates, or (2) synthesis and self-assembly of catalytic species or transition metal-based surfactant, and to exploit their sustainable properties in asymmetric synthesis. These chiral recoverable nanocatalysts are extremely promising alternative to homogeneous non recoverable catalysts. Towards flexible devices based on chiral nanoobjects. 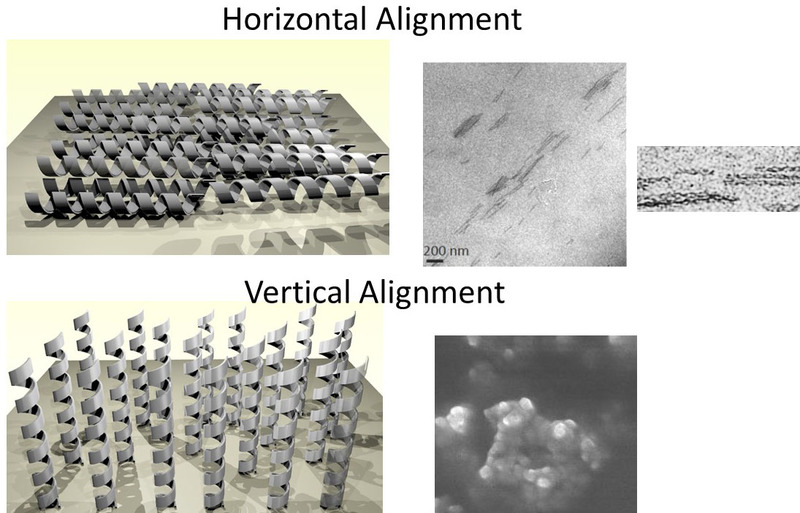 The key challenge for the use of these well controlled hybrid helices is their hierarchical organization into nano arrays. We particularly focus on controlled patterning and alignment of functional nanohelices by the use of hybrid nanohelices-polymer, Langmuir Blodget film or microfluidic devices (coll. J. Leng, Laboratoire of Future). 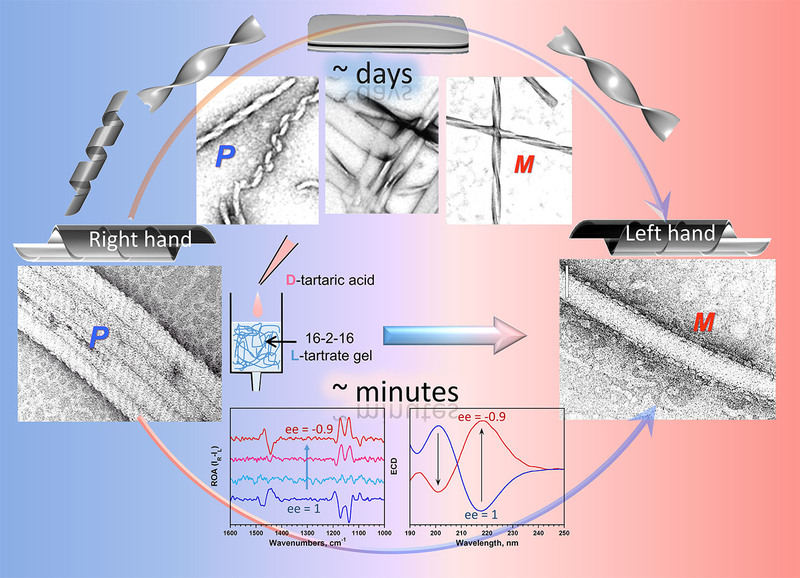 The silica nanohelices are elaborated to design Smart Synthetic ExtraCellular Matrices (SSECM), which could present the same order of dimension and periodicity as collagen fibers inside the ECM. 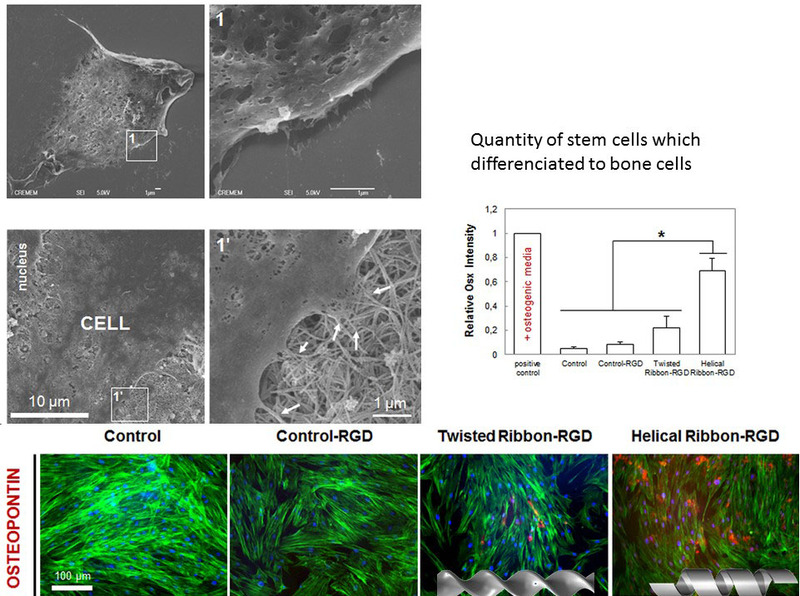 The objective is to evaluate the influence of the bioactive SSECM (functionalized or incubated with various active principles [cell adhesion peptides, cell differentiation peptides and microvesicles well-known by our team]) to hMSC in order to reproduce the role of native signaling biomolecules in term of phenotype, function and differentiation into mature specialized cells (adipocytes, chondrocytes and osteoblasts). 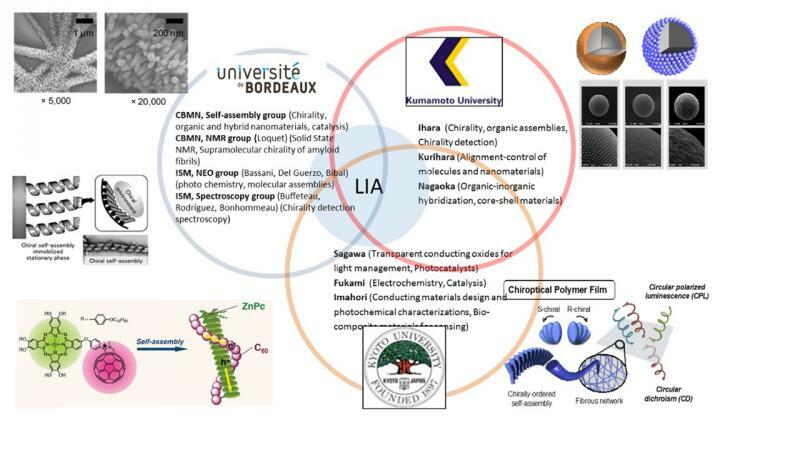 In 2015, our proposal for the France-Japan Laboratoire International Associé (LIA) has been accepted and a new LIA-CNPA has been created on Chiral Nanostructures for Photonic Applications (CNPA) - Hierarchical chiral nanostructures based on molecular assemblies for light management, sensor, chiral separation and catalysis. 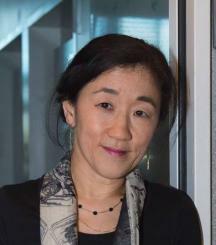 The consortium of 10 groups created for this collaborative research shows a perfect complementarity while sharing specific or common competence between the different partners: chiral organic self-assembly (Oda (France), Loquet (France), Ihara (Japan)) and inorganic transcription to colloid suspension and nanoparticle organization (Oda (France) + Ihara (Japan)), synthesis of polymer films or construction of scaffolds and inclusion of nanoparticles (Ihara (Japan), Sagawa, Fukami (Kyoto)), designing photochromic molecules, and construction of functional molecular assemblies (Bassani, Del Guerzo (France), Imahori (Japan), Ihara (Japan)), chirooptical measurements (Buffteau, Loquet, Bonhommeau, Oda (France), Ihara, Sagawa (Japan)) and the evaluation of the functions of the composites (Sagawa, Fukami (Japan), Oda (France)).